Nine years after America invaded Afghanistan in the wake of the 9/11 attacks, American and NATO troops remain involved in heavy fighting. One year ago, President Barack Obama committed additional troops to the war while vowing to begin reducing levels in 2011. Though Obama revised "success" from creating a democratic Afghanistan to a stable one, grim news continues to emerge from Afghanistan. Andrew Bacevich, a professor at Boston University and former U.S. Army Colonel, thinks that even President Obama's pessimistic predictions for the country are too optimistic. Bacevich joins Bill Moyers on the JOURNAL to provide history and context to the news reports and explain why he believes America needs to rethink its foreign policy completely. >>Find out more about Andrew Bacevich and his views on international relations. >>Watch a web exclusive, extended interview with Andrew Bacevich. Andrew J. Bacevich is professor of international relations and history at Boston University. A graduate of the U. S. Military Academy, he received his Ph. D. in American diplomatic history from Princeton University. Before joining the faculty of Boston University in 1998, he taught at West Point and at Johns Hopkins University. Dr. Bacevich is the author of THE LIMITS OF POWER: AMERICAN EXCEPTIONALISM (2008). His previous books include AMERICAN EMPIRE: THE REALITIES AND CONSEQUENCES OF U. S. DIPLOMACY (2002), THE IMPERIAL TENSE: PROBLEMS AND PROSPECTS OF AMERICAN EMPIRE (2003, editor), THE NEW AMERICAN MILITARISM: HOW AMERICANS ARE SEDUCED BY WAR (2005), and THE LONG WAR: A NEW HISTORY OF US NATIONAL SECURITY POLICY SINCE WORLD WAR II (2007, editor). His essays and reviews have appeared in a wide variety of scholarly and general interest publications including THE WILSON QUARTERLY, THE NATIONAL INTEREST, FOREIGN AFFAIRS, FOREIGN POLICY, THE NATION, THE AMERICAN CONSERVATIVE, and THE NEW REPUBLIC. His op-eds have appeared in THE NEW YORK TIMES, WASHINGTON POST, WALL STREET JOURNAL, FINANCIAL TIMES, BOSTON GLOBE, LOS ANGELES TIMES, and USA TODAY, among other newspapers. 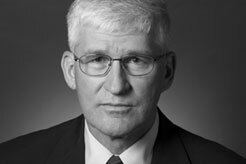 Andrew J. Bacevich's blog at WORLD AFFAIRS JOURNAL. "Déjá Vu in Marja: Our guiding illusions in Afghanistan"
By Andrew J. Bacevich, AMERICA, March 29, 2010. "How Petraeus could swing thinking on Israel"
By Andrew J. Bacevich, SALON.COM, March 17, 2010. By Andrew J. Bacevich, AMERICAN CONSERVATIVE, February 1, 2010. "Let Europe Be Europe: Why the United States must withdraw from NATO." By Andrew J. Bacevich, FOREIGN POLICY, March/April 2010. Coverage on Afghanistan from THE NEW YORK TIMES. Explore JOURNAL coverage of Iraq and Afghanistan and the effect of the war at home.